The wealthiest 400 people in the United States had their combined net worth grow thirteen percent to $2.29 trillion this year, amidst a surging stock market and record corporate profits. The figures come from the Forbes 400 list of the wealthiest Americans, compiled every year since 1982 by the American business magazine of the same name. As Forbes noted last week, the net worth of these 400 individuals is “about the same as the gross domestic product of Brazil, a country of 200 million people.” The average net worth of the Forbes 400 hit $5.7 billion, up by $700 million over the past year. The new figures of wealth in America were generally buried in the media. Neither the New York Times nor the Wall Street Journal published an article. Nor has it been a topic in political campaigns, one month before the midterm elections. Neither big-business party has an interest in calling attention to the extraordinary levels of social inequality in the US, with endless claims that there is no money for basic social services. Last week marked the sixth anniversary of the signing of the Emergency Economic Stabilization Act of 2008, which established the $700 billion Troubled Asset Relief Program, better known as the bank bailout. Since then, the wealth of the richest sections of society has soared while the annual income of the typical household has fallen by five percent. Since 2009, the combined net worth of the Forbes 400 has nearly doubled, from $1.27 trillion. The explosive growth of social inequality is the direct and intended product of policies carried out by the Bush and Obama administrations in the aftermath of the 2008 financial meltdown: the flooding of the financial system with cheap cash, coupled with a coordinated attack on wages and social programs. 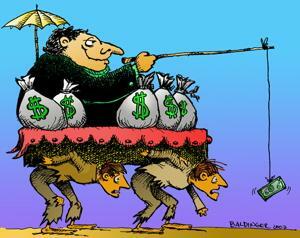 The enrichment of America’s super-rich is exemplified in the individual members of the Forbes 400. * Bill Gates, co-founder of Microsoft and the richest man in the US for 21 years in a row, had his wealth increase $9 billion in one year, to $81 billion. Gates’ wealth has increased by a staggering $31 billion in the past five years. To put this figure in perspective, since 2009 Gates’ wealth has increased by nearly 30 times the annual budget of the city of Detroit, currently in bankruptcy. * Investor Warren Buffett, the second on the list, had his wealth grow to $68.2 billion, up by more than $10 billion dollars in a year. Buffett’s wealth has increased by nearly $30 billion since 2009. * Larry Ellison, the CEO of Oracle and third on the list, saw his wealth nearly double since 2009, from $27 billion to $48.7 billion this year. * Facebook CEO Mark Zuckerberg, currently 11th on the list with a net worth of $34.1 billion, had his wealth increase seventeen-fold from 2009, and by $15 billion over the past year. In 2009, some of the members of the Forbes 400 list were not billionaires. Now, the cost of entry is $1.55 billion, and there were 113 billionaires in the United States who were left off the list. This year’s Forbes 400 list is dominated by the financial sector. While finance and real estate made up 4.4 percent of the first Forbes 400 in 1982, this industry now makes up 21 percent, according to the Washington Post. Individuals who made their wealth from hedge funds made up 7.8 percent of the list, 6.3 percent are in private equity and 5.3 percent are in money management. Despite the official presentation of capitalism as a high-risk, high-stakes game, it proved remarkably difficult for the fortunes of the super-rich to go anywhere but up. Only thirty-six members of this year’s Forbes 400, less than one in ten, managed to lose money over the past year. Three out of four had their wealth increase. In the wake of this series of disasters, Arison suffered a mere 2 percent fall in his wealth over the past year, leaving him with $6.5 billion. Shortly after the release of the Forbes 400, the Organization for Economic Co-operation and Development published a report concluding that global social inequality has eclipsed the pre-Great Depression highs during the 1920s, hitting the highest level since the 1870s and 1820s. The survey, however, does not include the enormous growth of social inequality that has taken place over the past fourteen years. Once those changes are taken into account, it is possible that the present level of global social inequality may be the highest in the history of the modern world.